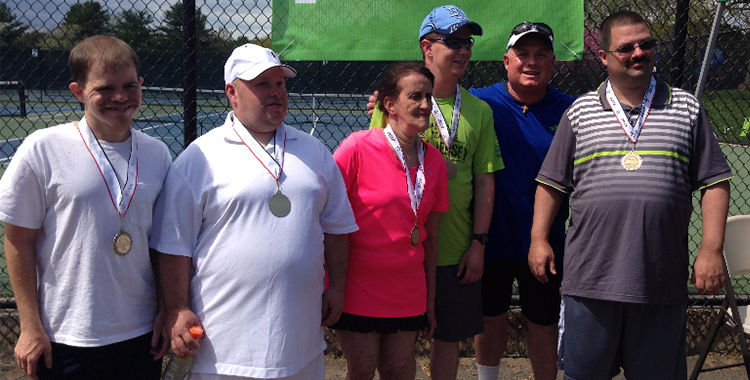 The New Jersey District is proud to be hosting Allied Doubles Tournaments throughout the state. The tournament format started as a New Jersey District pilot program, which is funded by the district, to provide more play opportunities to athletes with special needs in our sport. Although the athletes get to participate in Special Olympics, there are very few competitions during the year. The tournament format consists of all doubles competition. Athletes with special needs are paired with volunteer partners to play in one-day tournaments. The matches are times, and teams try to win as many games as possible within the time limit. The winner of each round robin group moves on to a playoff, which is a best 2 out of 3 sets match. The tournament winners receive a trophy. This year, Cherry Hill Health & Racquet Club, RiverWinds Tennis Club and Princeton Tennis Program have all hosted a tournament. Eric Wall, who was named the 2014 Middle States Tournament Director of the Year, ran the Princeton tournament.